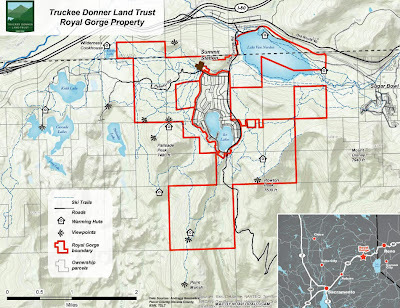 The Tahoe Donner Land Trust (TDLT), Trust for Public Land, and their partners purchased 3,000 acres of land on Donner Summit, including the Royal Gorge Cross Country ski resort. This land is now open to the public and will always remain that way. Lake Van Norden from Old Route 40. Now the community has the opportunity to help plan for the property’s future. TDLT has hired the firm Heidi Kolbe and Company to facilitate community meetings and focus groups that will take place in July and August. TDLT wants your input. The website, royalgorgeoutreach.org provides outreach information and an on-line survey. 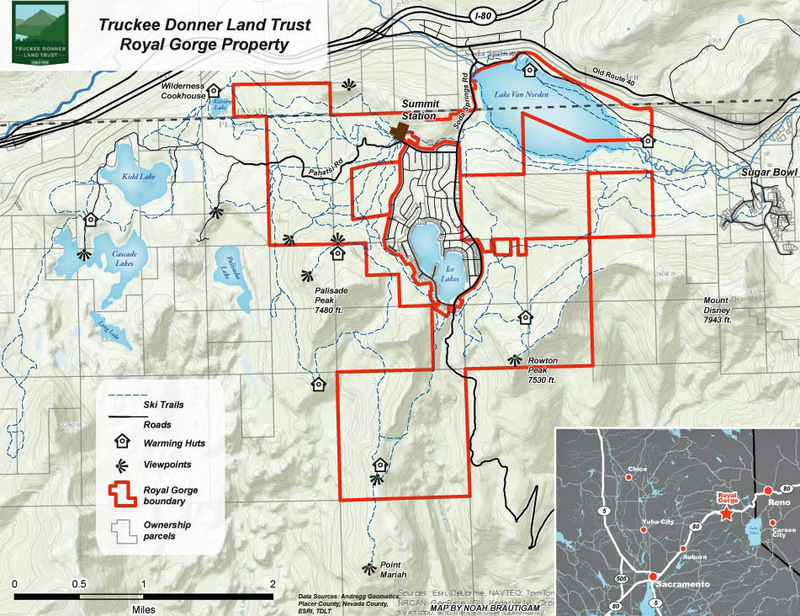 The survey allows the public to “vote” for various upgrades such as: the types of trails to build, picnic tables to add, camping provisions, forest restoration, summer recreation, and improving the skiing experience. June 15, 2-4pm, Donner Trail School, Kingvale. Wide-ranging discussion. June 17, 6-8pm, Cedar House Hotel, Truckee, Wide-ranging discussion. July 6, 3-4pm, Serene Lakes Firehouse, Forestry Management. July 29, 9-11am, Mt. Judah Lodge, Sugar Bowl, The dam at Lake Van Norden. August 31, 9-11am, Mt. Judah Lodge, Sugar Bowl, Final wrap-up discussion. There will also be a property tour and a series of hikes throughout the summer. You can sign-up for these free activities on the TDLTwebsite.